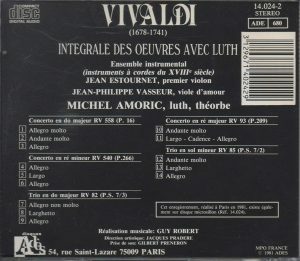 I was happy when I found this CD at an affordable price, Vivaldi’s “complete works with lute” played by Michel Amoric and an instrumental ensemble led by violinist Jean Estournet, a release from the French label Ades dating from the early years of the CD (released in 1986 – the recording itself is from 1981) and, for that reason, hard to find, because not even listed on most Amazons, and hardly anywhere else. It was well-received back then by the Vivaldi critics that I read and, in 1981, it was considered by some to be “state-of-the art” in interpretation. Although the back-cover credits mention “string instruments from the 18th century”, I’m not sure they are period strings, but it’s a small ensemble nonetheless with five solo strings and woodwinds. Yet, at one point while listening to the CD, I started wondering : “why is the music so unexciting?”. I mean, it’s Vivaldi, his wonderful works for lute – Concerto RV 558 (which in addition to lutes has mandolins, and much more), RV 540, RV 93, Trios RV 82 and 85 – it should be colorful, playful, touching, exciting, no? But here it sounded so… proper (as in “Victorian proprieties”), elegant, stately, music sounding serious rather than having fun. So I pulled out of my shelves Il Giardino Armonico’s recording of “Concerti per Liuto e Mandolino”, Teldec 4509-91182-2 (1993), which shares the three concertos and two trios offered by the Adès disc and adds two more concertos (the two marvelous RV 425 for Mandolin and 532 for 2 Mandolins), and the one by The Parley of Instruments, “Music for Lute & Mandolin”, Hyperion CDA66160 (recorded 1984), with the two trios and Concertos RV 93 and RV 540 (+ the same two Mandolin Concertos). And, oh, wow. Going from Amoric-Estournet to Il Giardino Armonico in the first movement of RV 558 (which opens both discs) is like from going from your old, puffing sedan to a Formula 1 – or going down the roller-coaster as opposed to going up. Fasten seat-belt, stiffen your neck for the acceleration and be ready for your hair to fly! 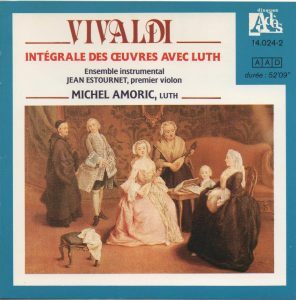 At first, I had thought that Amoric and friends’ cautious tempi might have something to do with the limitations of the plucked instruments, whether mandolins, lutes or theorbos: after all, there’s just a number of strings you can pluck within a second. But if such technical limitations, they clearly don’t apply to the performers of Il Giardino Armonico! RV 588 a fabulous work, a late concerto of Vivaldi and one of his best (among many great ones), and, as its original title rightly puts it, it is not so much a concerto “for” mandolins as a concerto WITH two flutes, two theorbos, two mandolins, two chalumeaux (salmoè), two marine trumpets (actually a string instrument of the violin family) and a cello, all getting their share of the limelight, a “concerto for orchestra” ahead of time. But that greatness you will immediately perceive listening to Il Giardino Armonico, not so with Amoric & friends, if even you perceive it at all. I don’t want to be unfair to them: to their credit, I love the sound of their chalumeaux, sounding less like clarinets than like the sound you imagine would come out of one of those big-sized sea-shells or “conch”. There’s also a nice touch in the Andante: it is scored for violins and mandolins playing in unison, and frankly the mandolins, even in Il Giardino’s version, can hardly be heard, just soft punctuations under the violin line. So the Adès players repeat part of the movement with mandolins playing alone: not prescribed by Vivaldi, but very welcome. Still, it’s not enough to offset the rest, and if I had a sense of lack of excitement hearing them the first time around, it is true boredom after Il Giardino. Difference in choice of tempo isn’t as pronounced in the Concerto for Viola d’amore and lute RV 540 – the march-like outer movements rely more on energy than speed – but even there, as soon as the first movement, Il Giardino Armonico scores, because its basic tempo IS slightly more animated, because its strings phrase with more muscularity and because its two solo instruments sound fuller. And their Finale sounds like a Finale, e.g. more animated than the first movement, where Amoric & friends adopt exactly the same beat, which is not only wrong but makes the music sound stately and unexciting. Very typical is also the way the respective viola player phrases the chords indicated as “arpeggio” in the score (at 2:30 on Adès): two eighth-notes per beat for Adès’ Jean-Philippe Vasseur, vs dazzling spiccato arpeggios (and remember: at a faster tempo) for Giardino’s Enrico Onofri (at 2:10). Paul O’Dette and The Parley of Instruments are also preferable though not as convincing as Il Giardino, with an apparently more reduced ensemble and a more astringent tone. They too adopt the same beat in first and last movements, but that’s because their first movement tempo is faster. And I like their fastish and unsentimental approach to the Largo. Amoric and friends take it the slowest of all, but it’s okay, the music here can take a variety of approaches. But if sometimes it’s not so bad, sometimes it’s even worse. Going from Il Giardino, and even The Parley of Instruments, to Amoric in the Chamber Concerto RV 93, my jaws drop with a big boink! I was braced for the worst, but it’s even worse than that, they stroll at such a trudging tempo in the first movement that this wonderfully lively composition is deprived of any life. If I stretch my understanding abilities to their maximum, I guess there is a certain nonchalant elegance to the approach, one that would make Vivaldi suitable for young maidens of the nobility in galant 18th century France – when under surveillance of their duegna, I mean. No wonder I was bored on first hearing! I have nothing against their flowing tempo in the middle Largo, but there’s so much more imagination in the ornamentation of Il Giardino’s Luca Pianca. To Amoric’s credit, though, the improvised cadenza at the end of that Largo, and the Finale is fine, not as animated as Il Giardino’s and with Amoric’s instrument sounding more metallic and less virtuosic, but not inferior to the Parley’s. Would this have been the rule and not the exception! Same with Larghetto and Finale of the Trio RV 82, or with the complete Trio RV 85 (with there too a very flowing Larghetto, and, for once, a nicely racing Finale): despite Amoric’s somewhat metallic tone, they compare well to The Parley’s; but in tonal luster, technical ease and interpretive imagination, Il Giardino is in another dimension, and nowhere more than in the middle Larghetto of RV 82, where they turn a very pretty Larghetto into one of Vivaldi’s most sublime inventions (see my review for more details on this). Il Giardino is Vivaldi for the Venetian tavern, a Vivaldi of blood, sweat and tears. Amoric & friends is Vivaldi transplanted in France and played at the Versailles salon of Queen Marie Antoinette, surrounded by her infamous sheep: prim, proper, elegant, Vivaldi for the ladies of the court – and their duegnas! Nothing to lose your head about. Despite the CD’s rarity value and the few nice touches of interpretation, this one is not staying in my collection, hello, goodbye.